We have revamped the store for fall and I was SO excited about it that I wanted to give you all a mini virtual tour. As you scroll you'll also get to see some glimpses of our new fall merchandise! 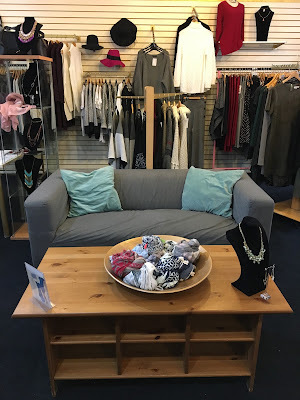 If you need a little break from shopping to reflect what you're getting OR if you prefer to shop with a friend, please relax enjoy the couch and the jukebox where you can choose your own music to shop to! You will find mannequins all over the store, where we carefully select outfits and layer accessories in hopes to inspire you. Our Bamboo Collection is a necessity for layering. If you are already a seasoned Dakota Mae professional you definitely have your fair share of it and there is ALWAYS room for new styles & colours in your closet. It's that time now for the Fleece Lined Leggings! They are the coziest and come in 10 colours. They join the program with the Bamboo Turtlenecks, Mock-Necks, V-Necks and Heathered Leggings for fall. There is bamboo is for layering (which includes bralette's, crop tanks and regular tanks). We also have bamboo basics in long sleeve tops, sweaters and pants! All of the above: Fall staples. Fall means Sweaters! Chunky knit sweaters & sweater tunics with leggings. Both available dressy for work & casual for the weekend! These include necklaces, bracelets, earrings, scarves, rings and hats to name a few. All available in both dainty styles and chunky statement pieces. This concludes my fall Boutique Tour! I hope you enjoyed a small taste of both the store and what's here for fall! I look forward to seeing you soon and helping you to find the most perfect addition to your closet. Whether you've been shopping here for years or you're a new face! Follow our Instagram, Twitter, Facebook Page for more fun along the way!